Vineet Chandgothia, Owner of KVK Corporation, welcomed all delegates and explained how the organisation has grown within India in recent years, as well as stretching its presence by holding events in seven other countries including the one currently taking place – its 2017 annual conference. Chandgothia introduced esteemed guest speaker Dinesh Kumar, First Secretary of Development to the Indian High Commission in Abu Dhabi. Kumar revealed how he was confident in further investment across the UAE following the contributions that the members of AIIGMA have already financed. Current President Anish Patel welcomed over 200 delegates to the opening. Under this year’s event theme of New Challenges – New Solutions, he spoke about the significant growth in the production and use of industrial gases in the region in the 1970s. Due to this rapid growth, it was identified that a body to represent the industry was needed to build relationships with the Indian government, and so AIIGMA was incorporated in 1975. Now, the organisation has 310 member companies. Patel then switched the focus to the current day, expressing his belief that the Indian industrial gas industry could be increasing its trade with UAE – a relationship boasting a long trading history dating back over 3,000 years. But he said that the challenge for our industry lies in finding the right people to work in our industry, a task that is currently being addressed by training programmes. With digitisation infiltrating every corner of our society, Patel acknowledged how the change in technologies is also a growing challenge for our industry. He outlined how our industry aims to embrace these changes but cautioned that the technology change is accelerating and we are simply not keeping up. He also mentioned how the introduction of Goods and Service Tax (GST) in India will present challenges for our industry, and how AIIGMA members need to be prepared. Patel concluded with optimism, saying our industry and AIIGMA members will have a great chance of success to meet these challenges head on. Guest speaker Kumar then took to the stage, thanking Patel for inviting him to attend the 39th seminar. He too touched upon the influence of digitisation, explaining how India has been trying to embrace new technologies, especially electronic and digital processes. He said the use of technologies will be the key to help reduce the costs of producing gases, which should in turn boost demand. KR Sahasranam, General Secretary, then highlighted how the growth in the metals, chemicals and glass sectors in India has enhanced demand for industrial gases – but he also outlined several challenges. One such obstacle is the need for consistent energy or power supply, and the industry needs to address the costs of cylinder distribution throughout the country. However, the future looks bright as he revealed that the oxygen demand across various industries is growing twice as much as gross domestic product (GDP), with other gases such as argon, nitrogen and hydrogen growing even faster. Saket Tiku, Chairman of the Organising Committee, then thanked the Indian Embassy for its continued support to AIIGMA. 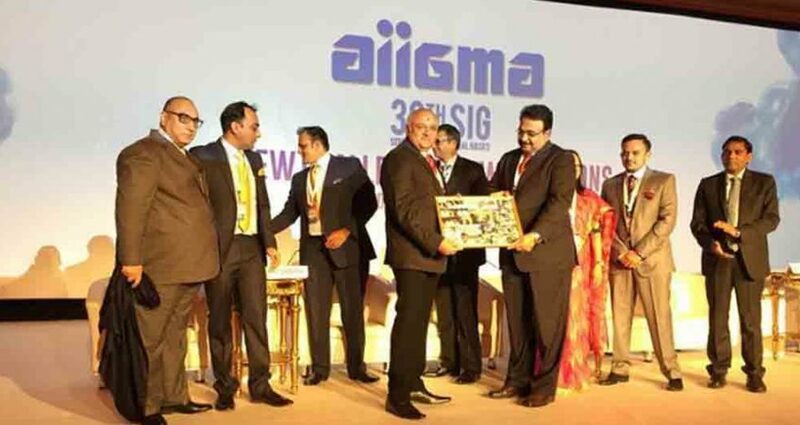 AIIGMA awarded recognition to Siddharthbhai Patel, the Chairman of Aims Oxygen, and RP Khator, Chairman of Bombay Oxygen, for their continued support to the organisation. Both had previously represented AIIGMA at President level on two different occasions. Siddharthbhai Patel, Chairman of Aims Industries, being presented for his continued support of AIIGMA. Treasurer Rajeev Gupta then gave a vote of thanks and set the stage for the first session of the conference which focuses on current innovative solutions within the industry and some of the challenges that have arisen.